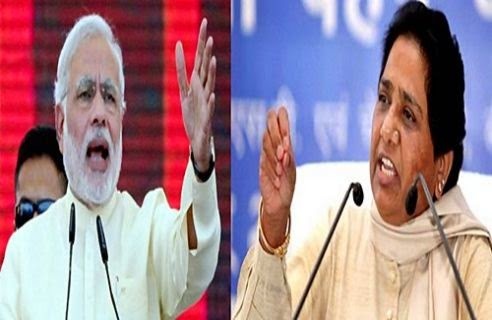 Lucknow,BSP Supremo Mayawati today dismissed any ‘Modi wave’ in the country saying it is a media hype and that the saffron party has even managed “astrologers” who are propagating such ideas. After casting her vote here, Mayawati said, “The country is in a mood for change. They want a good government in the centre which works in the interest of people and the country”.“The talk about the wave especially the comments of BJP’s Prime Ministerial candidate that there is a BJP wave, is present only in media and opinion polls. Now they have even managed astrologers who are building such air. I do not see any such wave on the ground,” she said.The former Chief Minister of the state said she would appeal that people must caste their votes.“People from dalit and other backward classes must exercise their franchise which they have got as a result of the long and arduous struggle by Dr Baba Saheb Ambedkar,” she said. Congress candidate and sitting MLA Rita Bahuguna Joshi also dismissed presence of any BJP wave or polarisation.Joshi who is facing BJP national President Rajnath Singh from here said Lucknow is a city of broad-minded working class which does not get swayed by such propaganda.“It is a very interesting election here. Lucknow has always sprung surprises. The election here is a direct contest between Congress and BJP while the parties will be left behind. There is no wave in Lucknow,” she said. The election result will depend on the performance of the candidates and their experience, former UPCC President said.“There is no polarisation in Lucknow. Lucknow is a secular city. People here have given importance to candidate. It is a middle class city, working class city, so don’t expect it to polarise,” she told reporters. Slamming the Uttar Pradesh government for not taking strict action against yoga guru Ramdev for his controversial remarks, Mayawati said the Samajwadi Party government had not taken action against him as he was “Yadav”.“We are demanding action against Ramdev under SC/ST Act. No action has been initiated by the state government against Ramdev as he is Yadav (by caste). SP has also not protested his statement”, she said. The BSP leaders said that EC has only imposed a ban on Ramdev and that is insufficient and stricter action is needed against him.“Despite derogatory remark against its leader Rahul Gandhi, Congress has taken this matter lightly. BJP leader Narendra Modi has also not reacted on it…”, she said.By making the comment, Ramdev has insulted Dalits and BJP was also misleading the community. On Apr 25, Ramdev had said that Congress Vice-President Rahul Gandhi goes to the houses of Dalits for honeymoon and picnic.“He goes to Dalits house for honeymoon and picnic, but if he would have married a Dalit girl then his luck could have clicked and he would have become the Prime Minister,” Ramdev had said here. Meanwhile, BJP National President Rajnath Singh defended Ramdev and said that his statements were misinterpreted.“His statements were misinterpreted. He has regretted his statement. After he regretted, the issue doesn’t stand”, Rajnath told reporters here.The BJP President also expressed hope of getting support from the people of Lucknow.